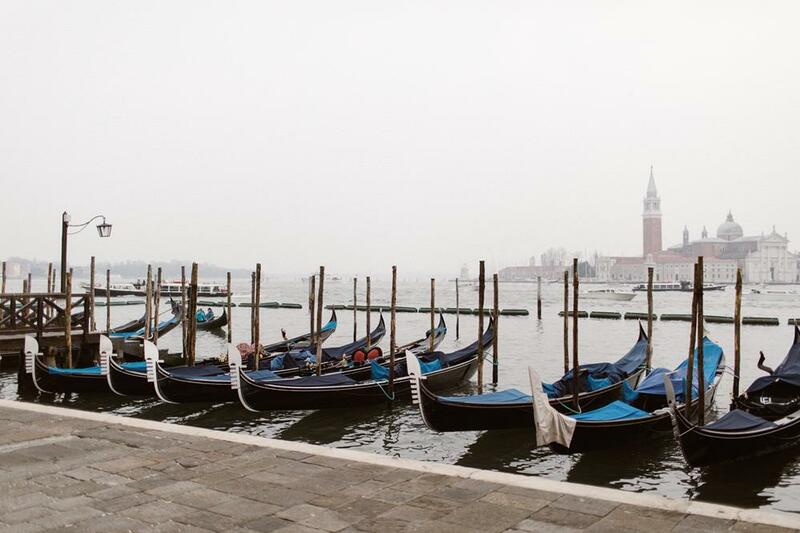 Venice is a captivating and seductive destination.. 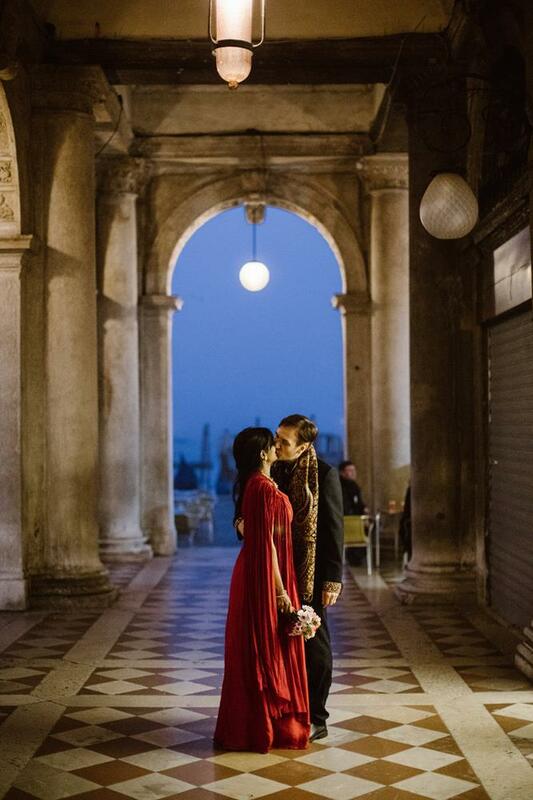 If you are considering a romantic elopement in Italy, low season is a perfect time. 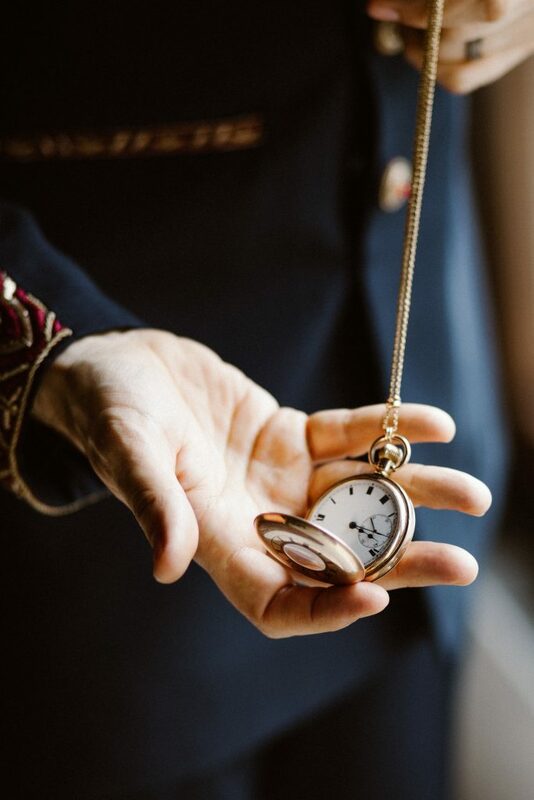 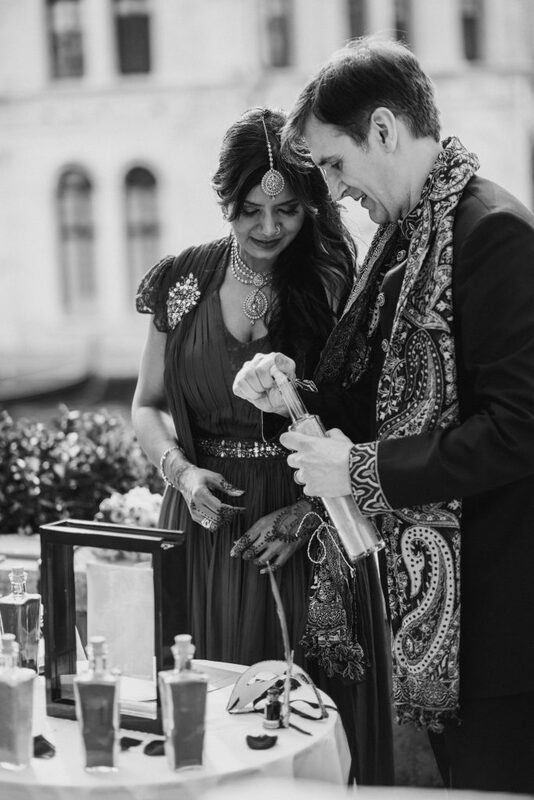 The stunning couple featured in this article chose early Spring to hold their intimate wedding blessing ceremony, ensuring a more temperate climate and less chaos. 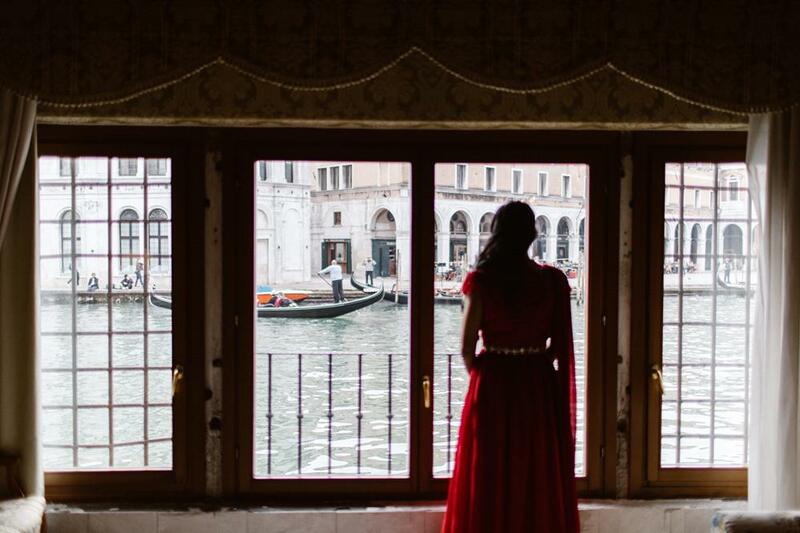 A historic gateway to the Orient, the city’s breathtaking beauty is the result of past influence and status as an independent trading point, which famously bridged the gap between complementary parts of the world. 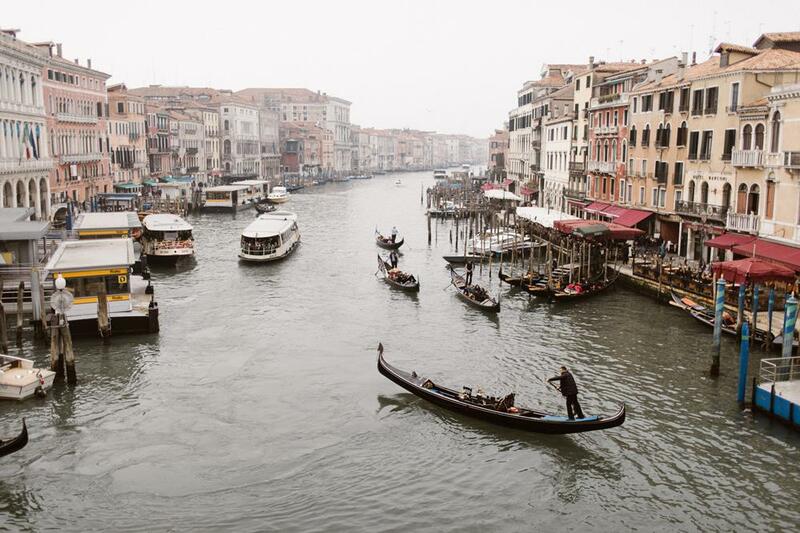 The enigmatic capital of Veneto is famed for its eclectic architectural style. 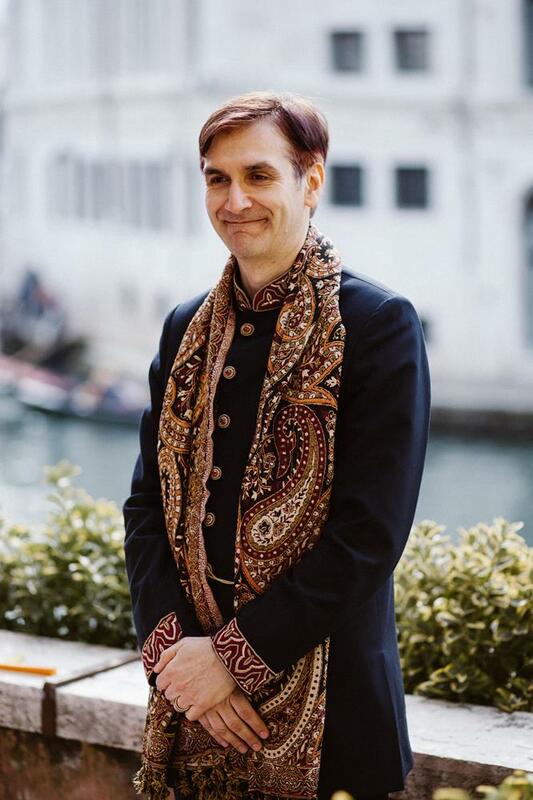 Byzantine and Ottoman influences evoke a gloriously Gothic 14th century presence, juxtaposed wth evidence of the Renaissance and Baroque. 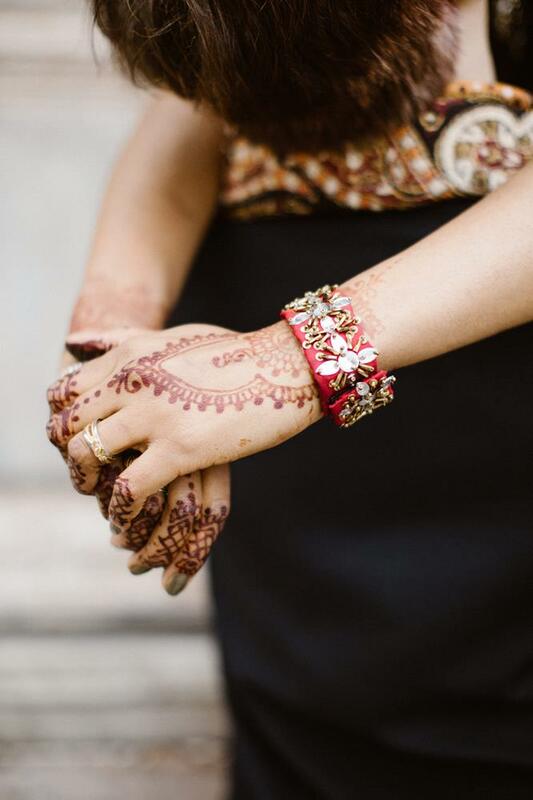 This sumptuous fusion evokes an olfactory sense of 13th century importation of exotic eastern spices. 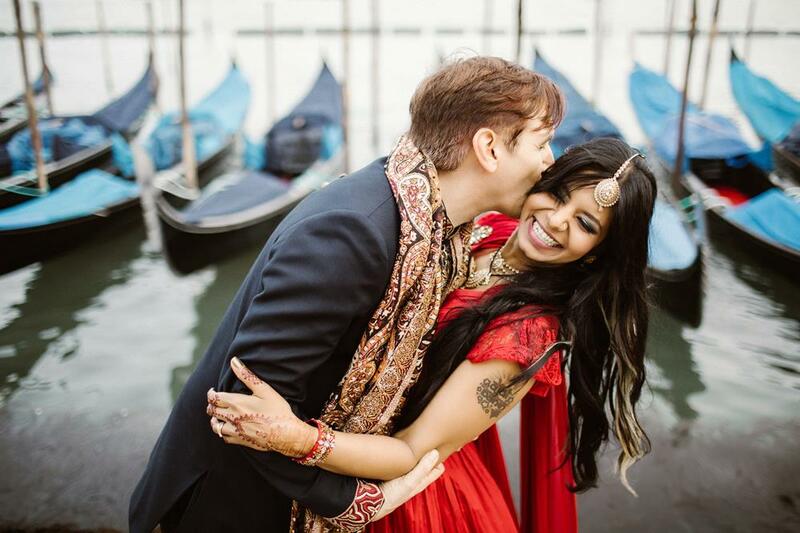 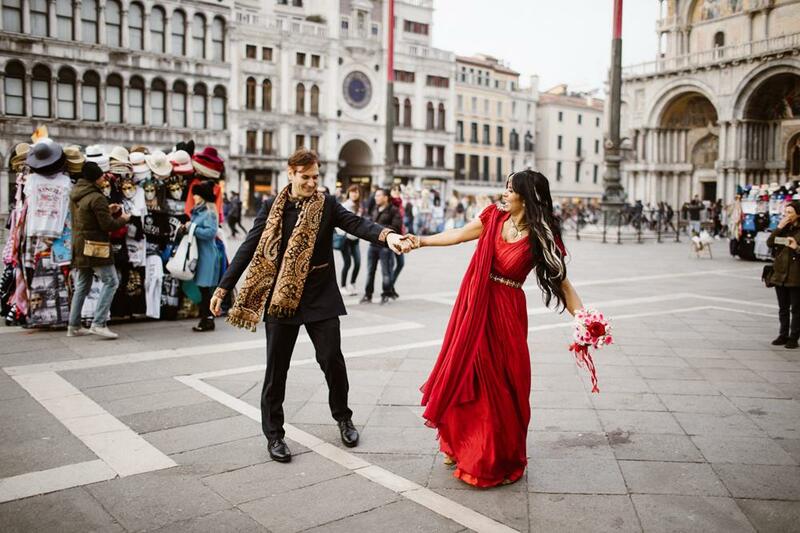 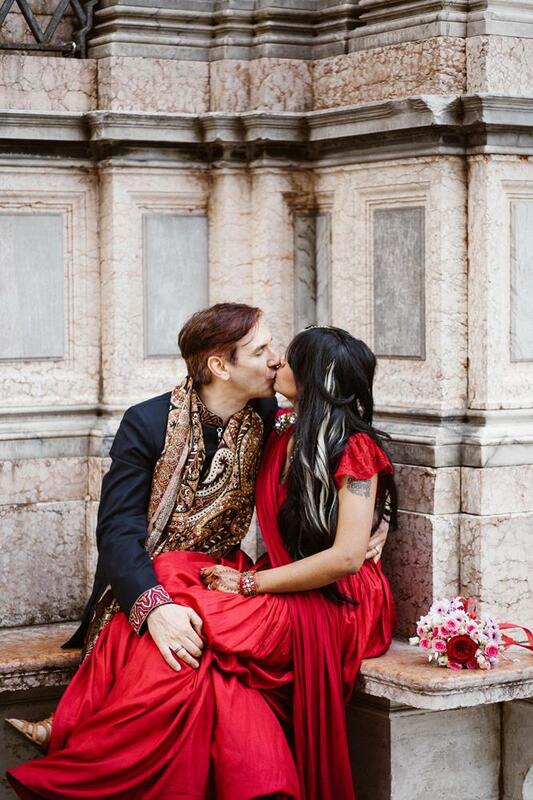 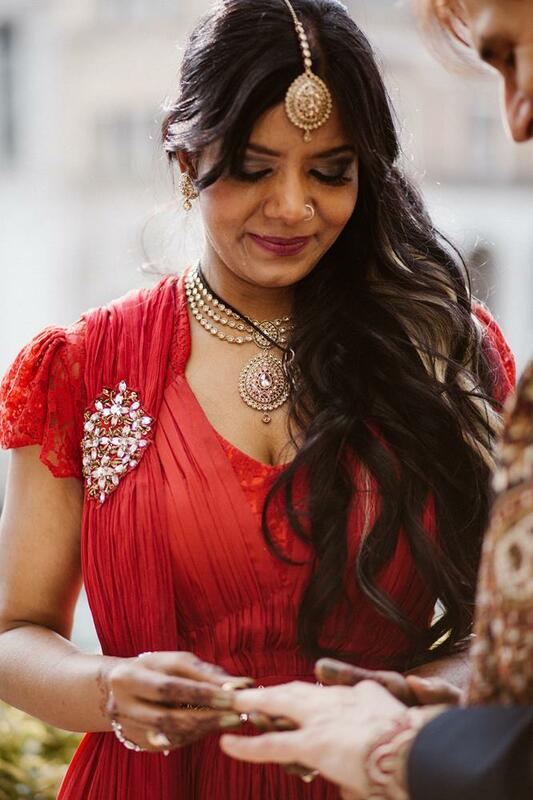 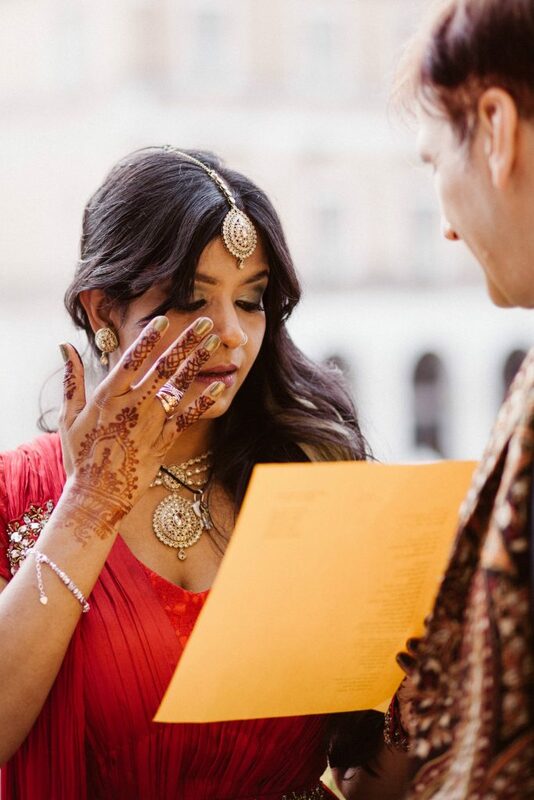 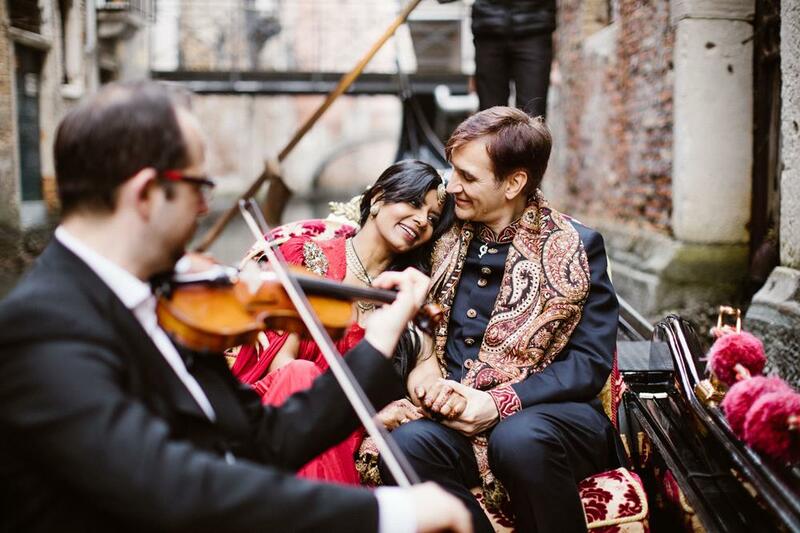 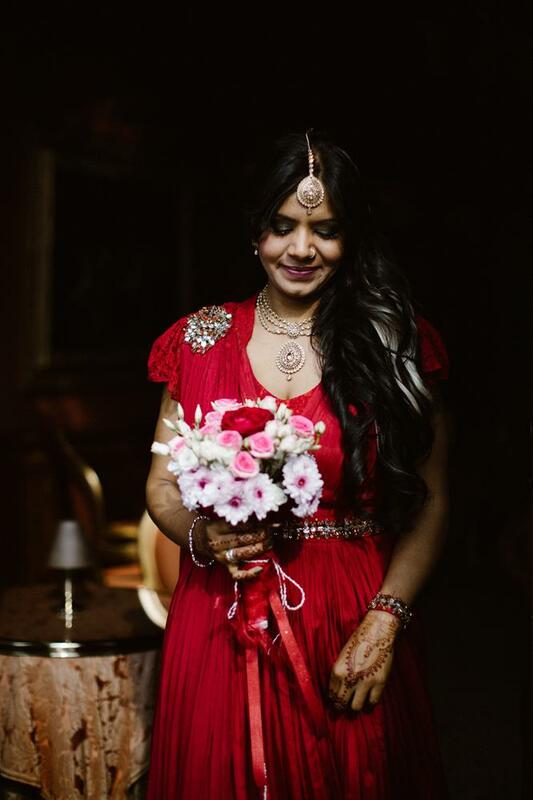 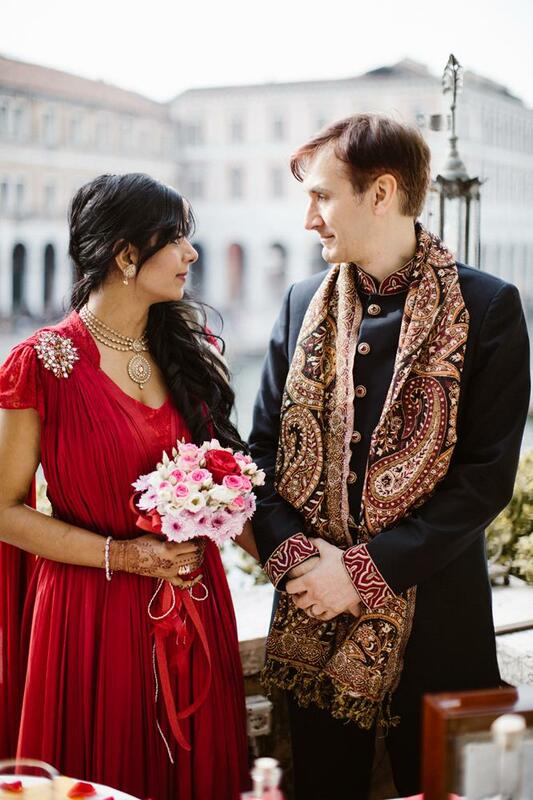 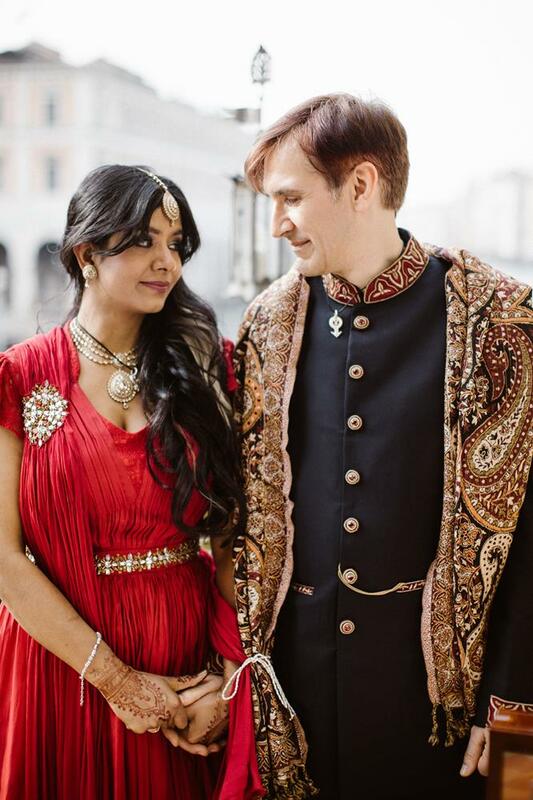 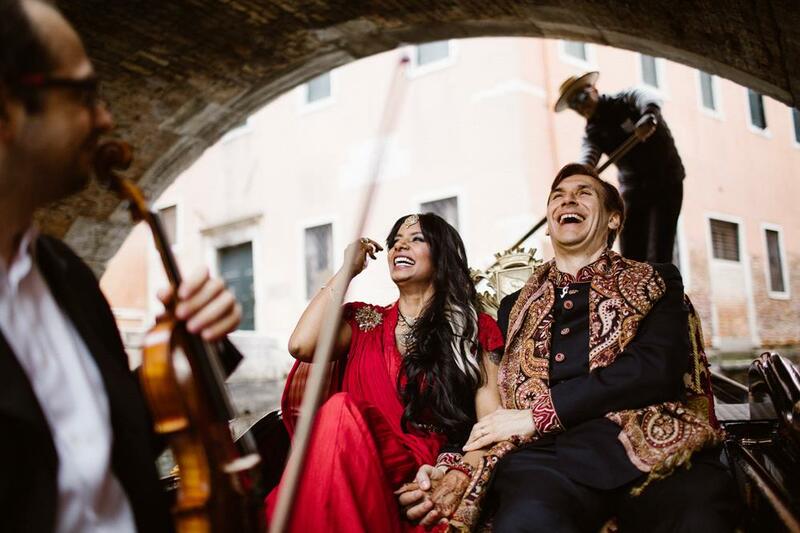 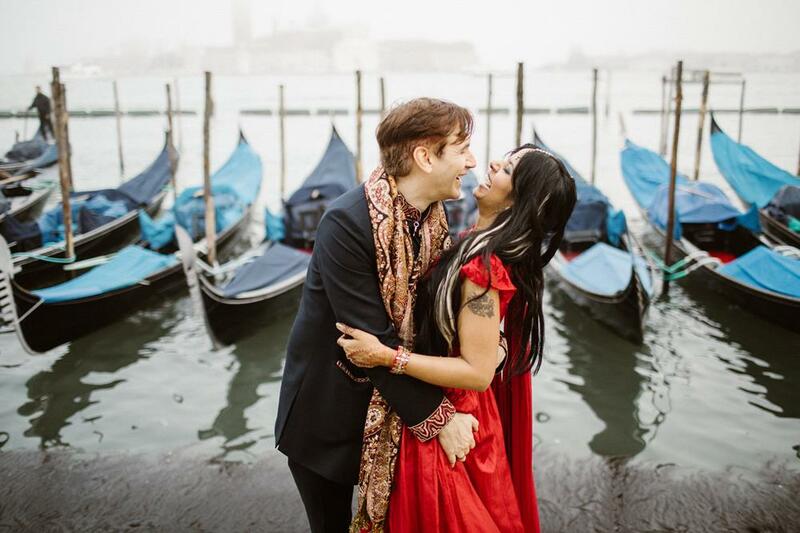 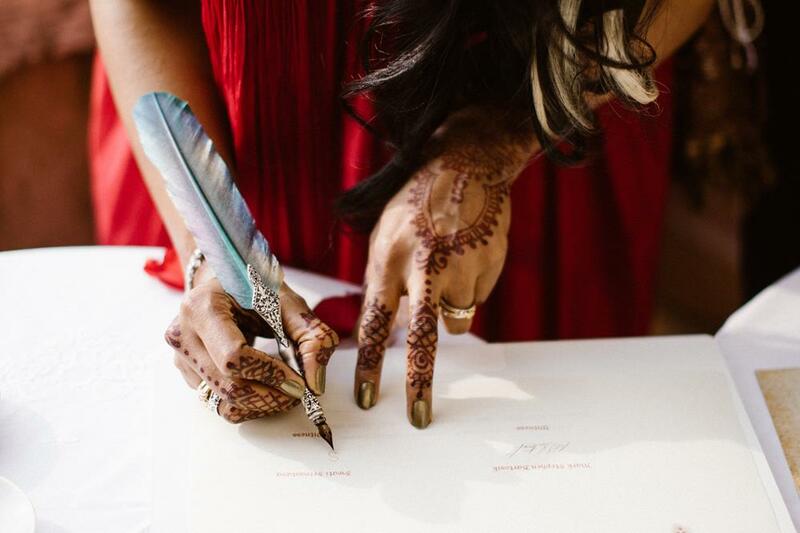 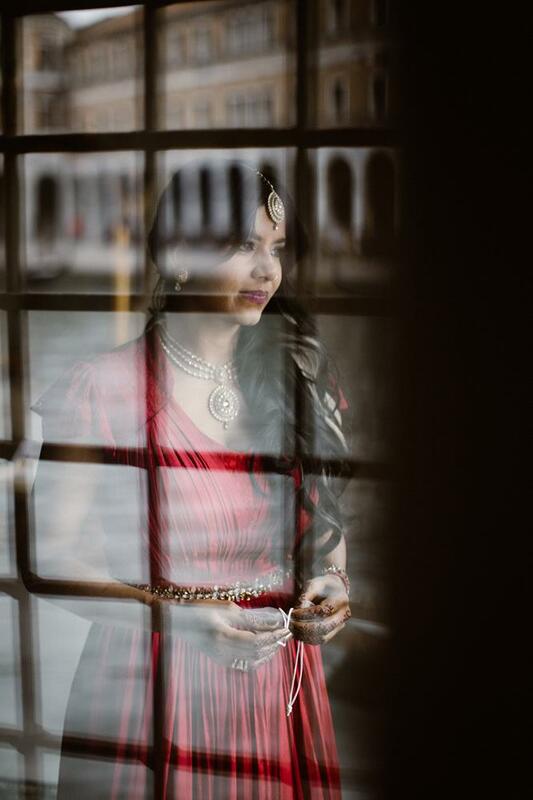 The filmic charm of Venice captivated a beautiful Indian Bride and her handsome English Groom, who decided to celebrate their union on the terrace of Hotel Al Ponte Antico in Cannaregio, conveniently situated within sight of the Rialto Bridge. 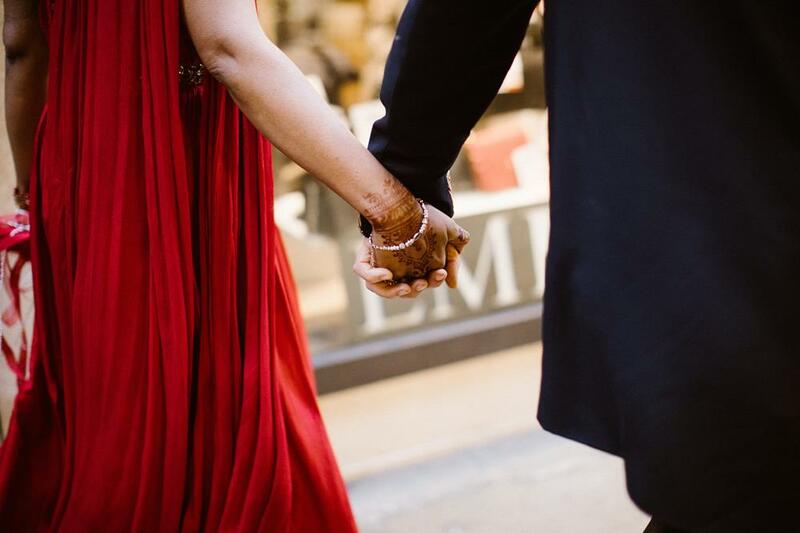 On a temperate Spring day we shared their dream of declaring their faith in one another. 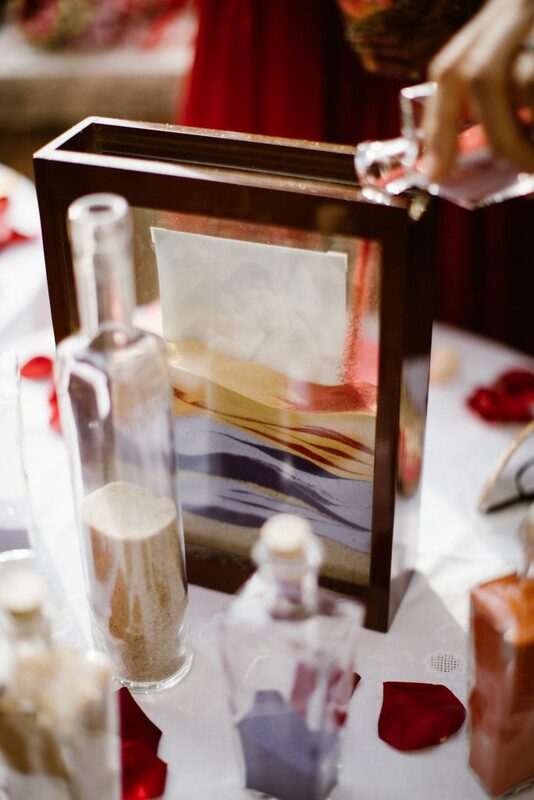 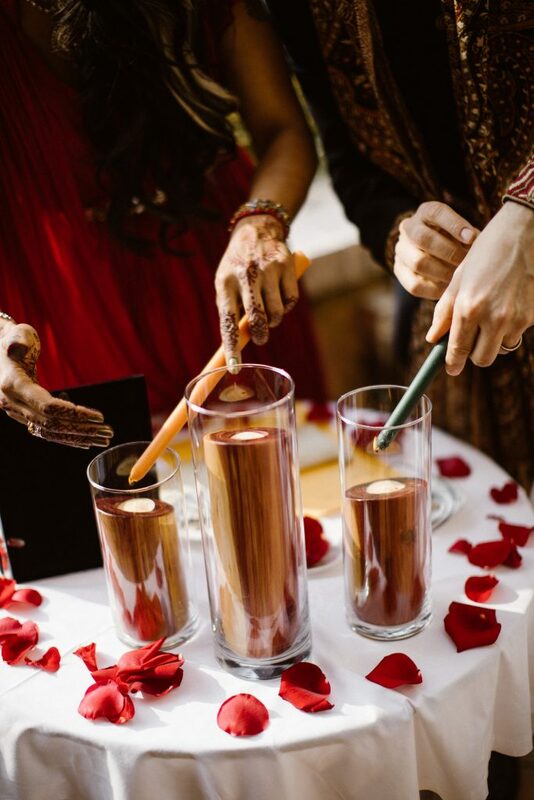 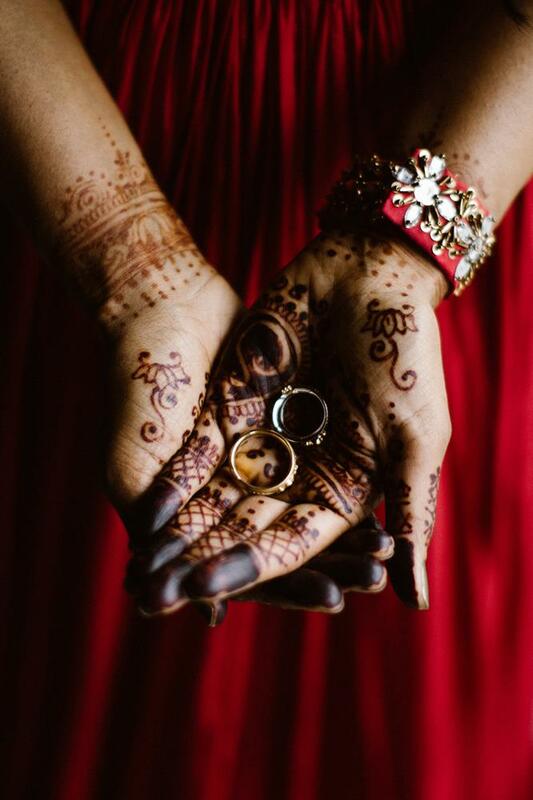 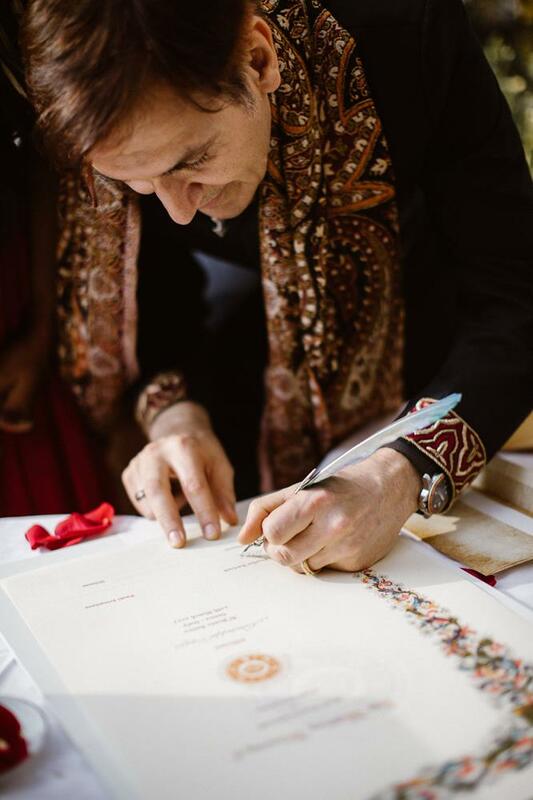 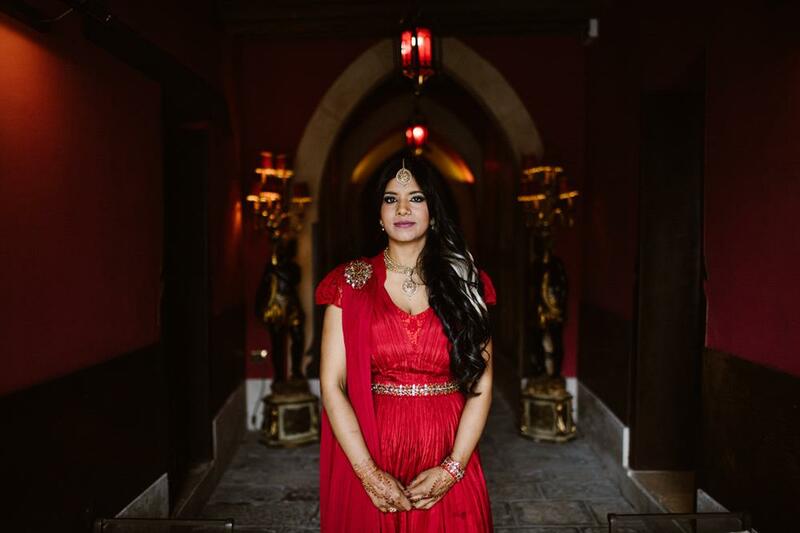 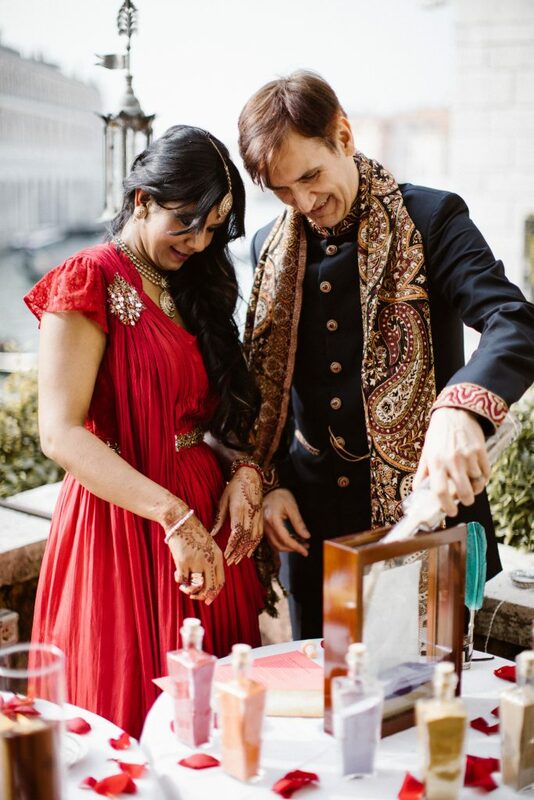 In the weeks leading up to the wedding day, we collaborated closely with them to create a deeply personalised ceremony, which blended together various rituals representing diverse aspects of Indian and European tradition. 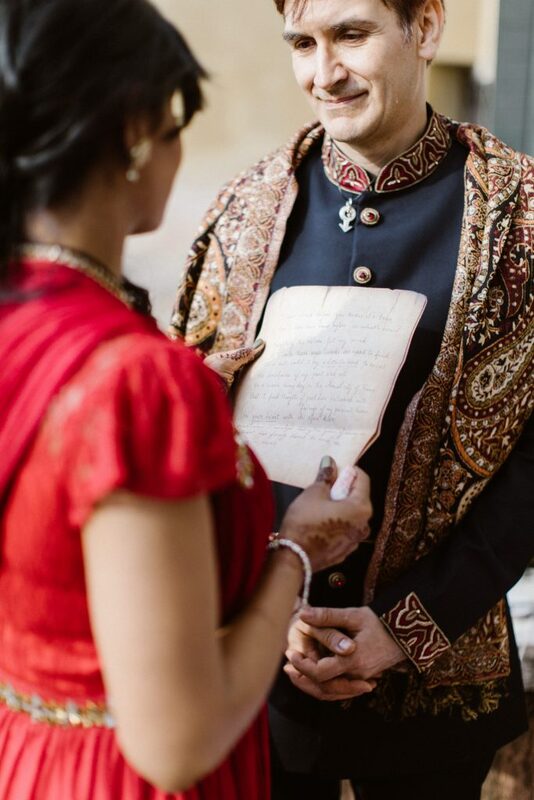 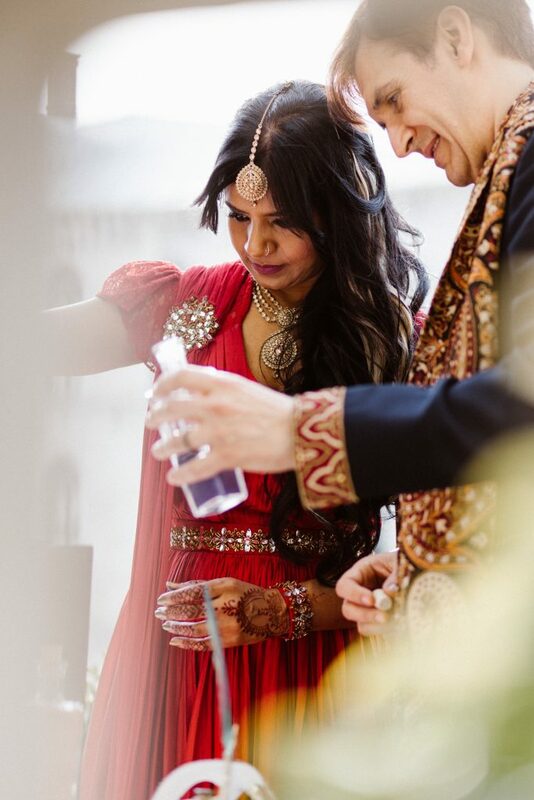 The Bride wished to honour her Indian heritage by including a ritual involving the presentation and tying together of shawls, demonstrating the intertwining of two unique lives. 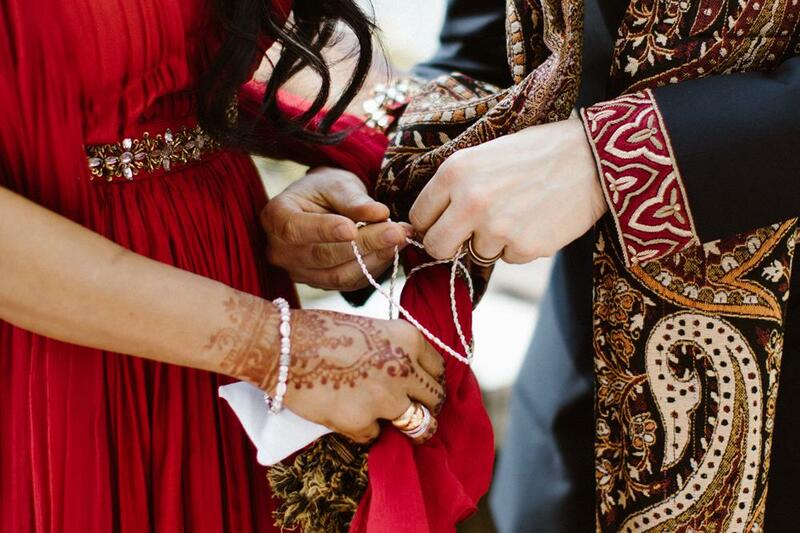 The expression of gratitude as individual parts of a greater whole was further achieved by offering ‘forever pair pendants’ instead of garlands. 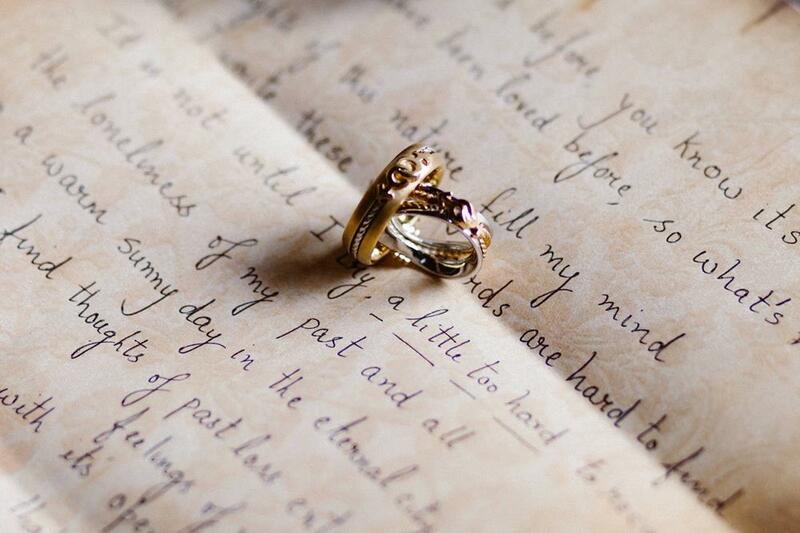 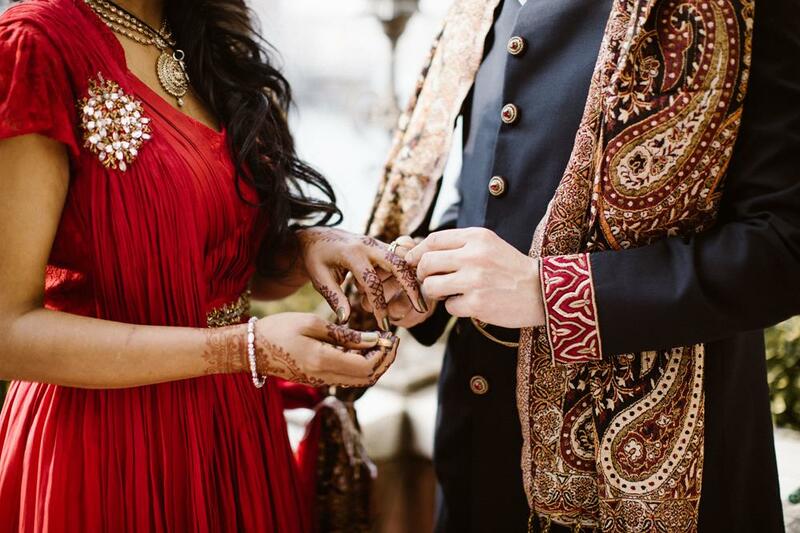 These were created from precious metal and symbolic of the inestimable value of their love and also served as a wise reminder that the acquisition of material wealth has no real meaning.. for it is the priceless memories created as a team which are the real value of a relationship.. 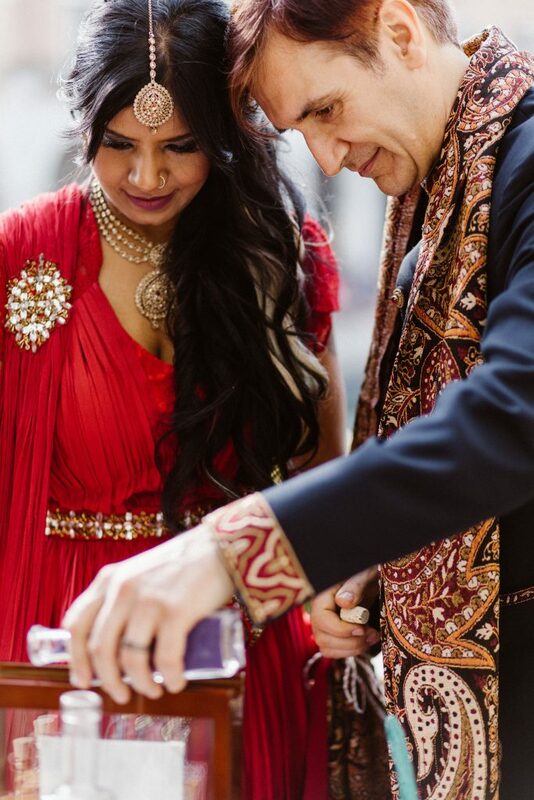 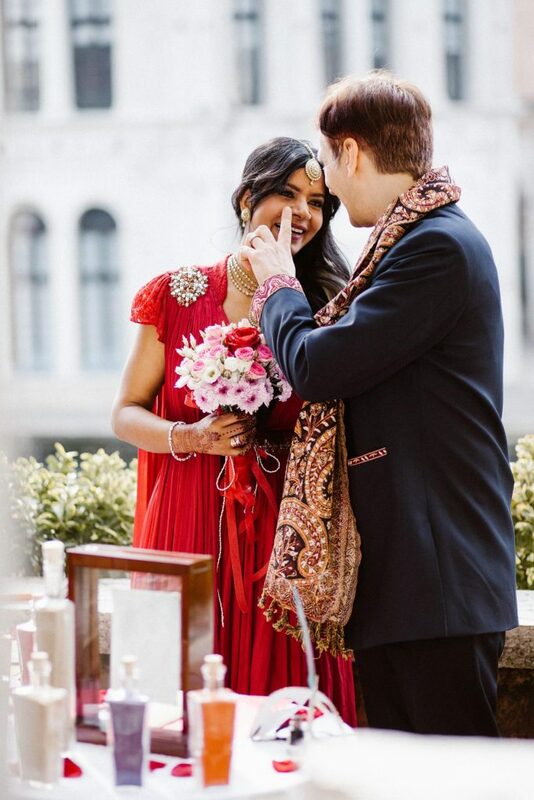 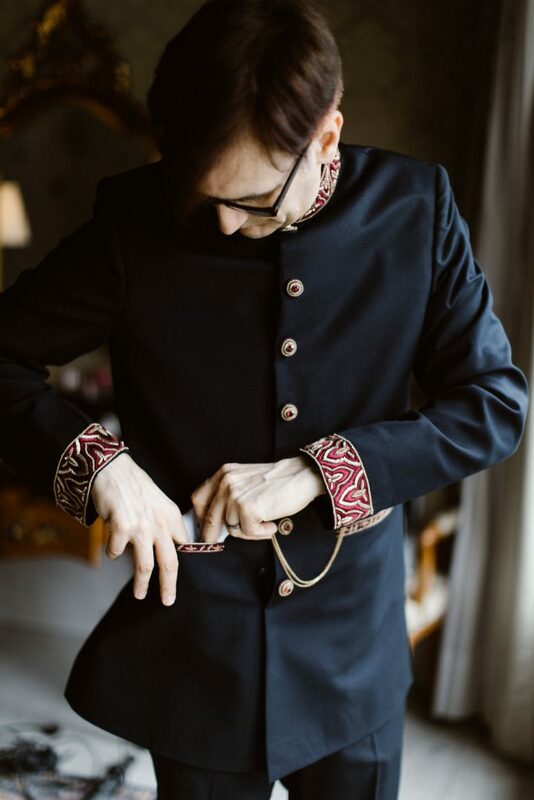 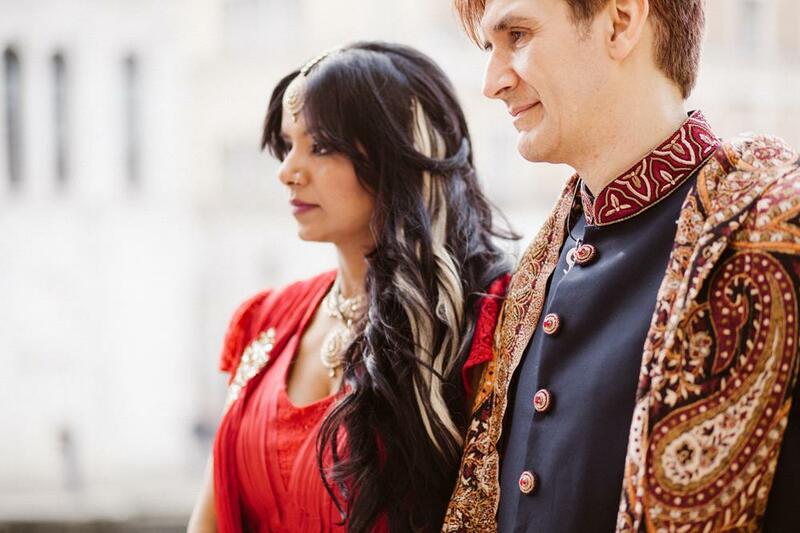 This ritual was inventively adapted by the couple, to give an important Indian wedding tradition of exchanging flower garlands, a European touch. 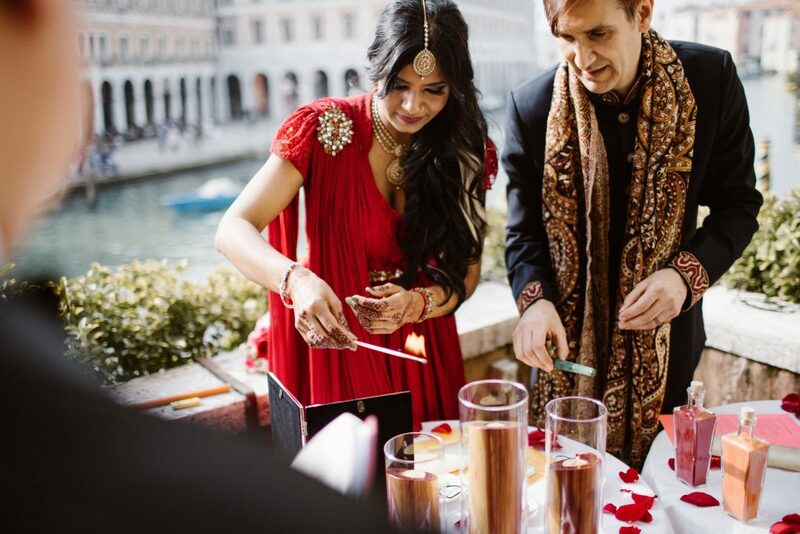 A Unity Candle ceremony after exchanging rings, symbolically illuminated the unknown journey ahead together with candles lit in honour of those who will forever inspire them to fulfill their dreams. 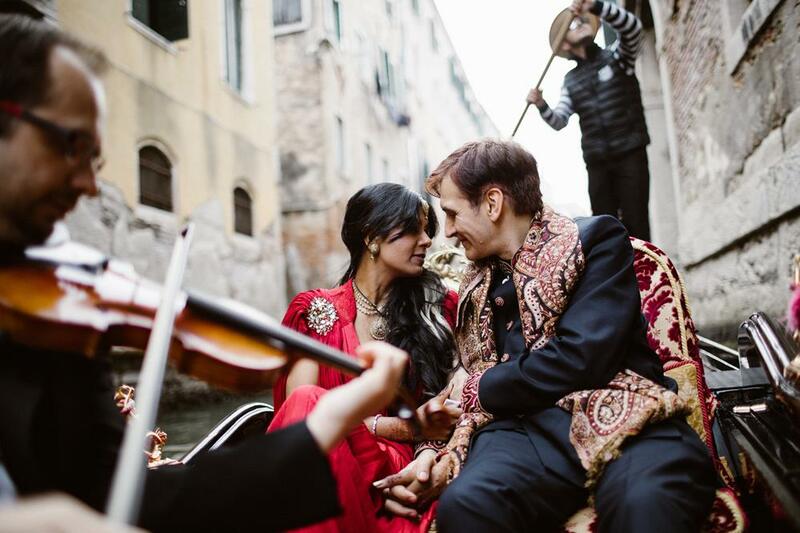 After beautifully composed personal vows, a selection of poems and a brief aperitivo on the balcony, the newly married soul mates were transported back in time to ancient Venice in a Gondola, serenaded by the sweet notes of a professional violinist. 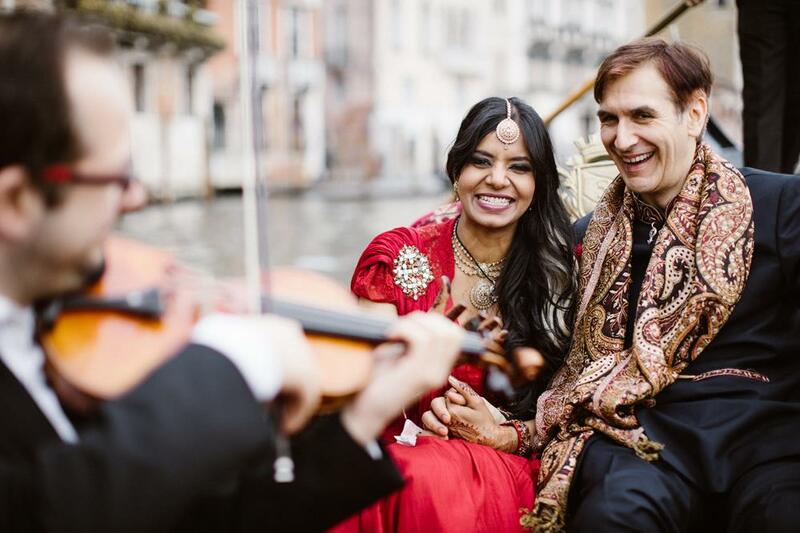 They enjoyed a visit to Europe’s prestigious Caffè Florian in Piazza San Marco and a ‘passeggiata’ by the side of the canal, during which the Groom couldn’t resist sweeping his beautiful wife off her feet as the sun set over a sleepy Venetian skyline. 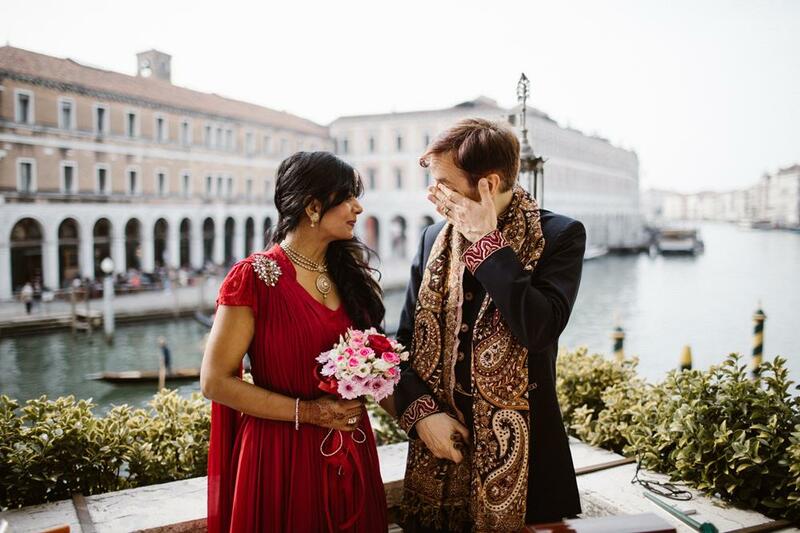 Looking at these vibrant and colourful images is a welcome opportunity for us to share a multitude of emotions we feel privileged to have shared.. on the day East met West and Venice rejoiced.